KINGSLAND WASTE, Hackney’s general-goods market, is on the verge of collapse. Now little-known, even by some shopkeepers in the same street, the Kingsland Road collection of stalls was once hugely popular with working-class people. 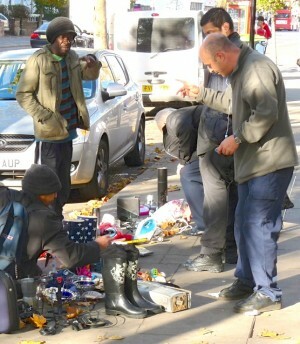 The council has told permanent and casual traders at The Waste that their licences will not be renewed although, it says, they can reapply to “trade from Hoxton Street Market or Ridley Road Market”. The reason is the “clean-up cost” of the “excessive waste” created by casual traders. and casual traders at its markets, “especially those who trade in confectionery, stationery, cooked hot food, arts and crafts, toiletries, china and footwear”. Council officers admit unofficially that the aim is “to close Kingsland Waste”. The closure could be temporary, in readiness for “a revamp”. Officially, the council will not admit to any plan to remake it as a market selling trendier stuff than household goods. In late summer this year 2014 it offered would-be traders free trial pitches in any of Hackney’s six markets, as well as rewards for existing stallholders for recommending the markets to others. Neighbourhoods councillor Feryal Demirci is quoted in a 19 August 2014 press release as saying: “The six markets that stretch across the borough are some of the most iconic in the capital, visited by thousands of people every week. In The Waste, traders are unimpressed, having this year had to find at least £5 a week extra for pitch rents. While we talk, Morris offers him, without explanation, a small old but working sound system and he leaves with it under his arm, beaming happily. sells general goods, as he has been doing in that market for 40 years. He knows nothing of the review, but he fears for the future of the market. Surprisingly, he thinks it stems from a crackdown on fly-pitchers several years ago. West acknowledges that the council was trying to act in traders’ interests to stop the rent-free selling by men selling out of battered suitcases they could reload quickly when they saw a market inspector. “But the fly trading,” he says, “was the attraction for a lot of people. They wanted bargains. To anyone who remembers the market a few decades ago it already looks finished. In the 1980s and early 1990s pitches pushed up against one another, all the way from the Fox pub at Middleton Road, north to the present Oxfam location at Forest Road E8 4AR. Now there are large gaps between stalls, and official pitch numbers, seeming to emphasise the gaps. Kingsland Waste used to be the Saturday destination for anyone wanting tools, garden equipment, bicycles and cycle accessories, cheap babywear, undies, CDs, vinyl, videos and new and secondhand clothing. To walk the length of the market took 15 minutes, such was the number of stalls on the well-maintained 5m-wide pavement and on the lower cobblestoned level. Once the routine household purchases were made, Norman’s stall would be approached, always with a sense of excitement and hope. It was not unlike leaving the best item on a dinner plate until the last. One could never predict what Norman might be offering. He was a trawler of auctions and household clearances, or is believed to have been, because he was cagey about where he got the tattered books, maps, cameras, pictures, frames… the variety and the quality span was great, the prices low. Soon all the pitches will be empty and Hackney council will be able to offer motorists a few more parking spots. Is that what the people of northeast London want? * Kingsland Waste Market appears in bits on the east side of Kingsland Road north of Middleton Road, Dalston/Haggerston E8 4DA on Saturdays, officially 7am to 3pm. * The local newspaper followed up this story almost a month later, then BBC London radio. Next Vice ran a piece, The Guardian more than a year later. Loving Dalston, first with the news that matters. The Market’s last trading day is Saturday, 28 March 2015, when it should be trading from 8.30am to 3pm. Since we apparently couldn’t save it, let’s at least all go along and give this wonderful old local institution a good send-off. As a resident born here over 70 years ago, I have used this market all my life, as have many others locally. I feel that the council now has a deliberate policy of ethnic cleansing in Hackney. Fewer coffee shops and more ordinary cafes is what we need. All these changes are being made by people not born here or who have not lived here. We must do whatever we can to save our grand traditions, although one can sympathise with the council as it tries to find a place for street markets in the modern world of online selling and other new forms of retail. Of course, the markets of Hackney are traditional outlets for small traders, but though they were usually Cockney, it is hard to see the assault on the market as ethnic cleansing. The least that we, and the traders, can demand of Hackney is some open-ness. Democracy! — Ed. A tragedy! One of the last remaining pockets of real local character is being wiped off the map. I hardly recognise the area I grew up in. I’m still a regular customer at the Waste market, as the kind of wares they sell are not available anywhere else, and if they were, I couldn’t afford to buy them. You can still pick up all kinds of household essentials from 50p or £1 and the people who work there are part of our community. I bet that five years from now there will be a new market, with organic coffee stalls and tiny posh cakes for £3 a pop. The things that made Hackney great are being rapidly eroded by a pretentious bunch of clueless toffs. The one staple, albeit unhealthy, institution, of any ’hood worth its reputation is the red-and-white branding of a KFC. But what we have in Hackney now are gourmet, burger, American-style so-called diners, quinoa, chia seed, aloe vera and “food” shops alongside “vintage” outlets. The Waste was and is a fabulous market. I bought a very good-quality mattress cover there 12 years ago and it is still going strong, as is my sturdy cassoulet cooking pot. I thought the market had gone for good but was happy to see a few stalls there again recently. Not all of us wants to go to “farmers’ markets” and buy an organic carrot for £3. I truly wish we had a council for real people who live in the real world. Save The Waste! Please leave London. Hackney’s in a prime location, situated near zone 1. It’s a shame to waste it. Just pack your bags and head north and live in estates. Leave London to those of us who contribute to the economy. I’m assuming your tone is sardonic, satirical. – Ed. You should stay in the City/Liverpool Street and never get out of there, banker speculator! An update: We have been told that we would not be able to sell our commodities at Hoxton or Ridley Road markets, the options we have been offered. If this isn’t constructive dismissal, what is?